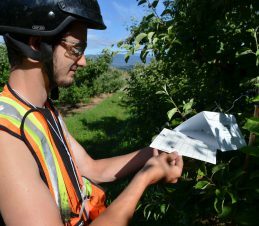 The Okanagan-Kootenay Sterile Insect Release Program (SIR) is an environmentally responsible, area-wide approach to control codling moth pest populations, one of the BC tree fruit industry’s most damaging and costly pests. 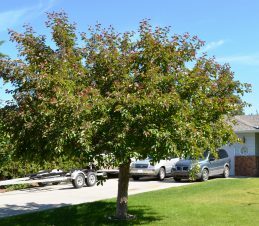 The program operates in the fruit-growing regions of the Okanagan, Similkameen, and Shuswap Valleys, where the tree fruit industry plays an important role in the lives of residents and commercial growers. We use Sterile Insect Technique (SIT) to produce sterile codling moths, which are then released at regular intervals to breed with wild moths. The mating pair cannot produce viable offspring and the result is a steady reduction in wild codling moth populations. Funding for the Program is split between local property taxpayers (60%) and commercial pome fruit growers (40%). 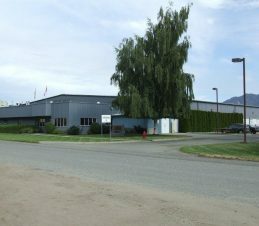 The program’s state-of-the art rearing facility has an annual production capacity of 780 million sterile codling moths, and the program is a major seasonal employer for the region. The success of SIR’s area-wide approach has meant that farmers require few to no pesticides to prevent codling moth damage. This creates major benefits for our fruit industry, our environment, and the health of our communities. 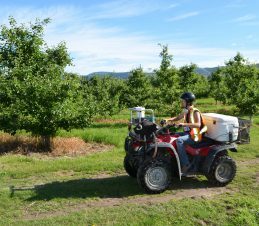 SIR Program field staff monitor wild codling moth populations in commercial orchards and in urban areas to identify locations where infestation has, or may, occur. Data is collected weekly throughout the summer season. Results of fruit and codling moth trap monitoring efforts are reported to orchardists and urban tree owners on our website under Trap Viewer, and indicate if growers need to carry out more codling moth control measures. SIR staff meet with urban residents to provide information about the Program and the steps they can take to keep host trees free of codling moths. Each year, we produce around 220 million sterile codling moths at our $7.4 million facility in Osoyoos, B.C. Sterile codling moths are released into commercial orchards every week during the growing season (May through August). 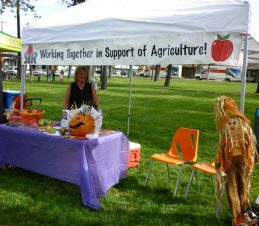 Program staff raise public awareness of codling moth and the SIR Program through presentations and hosting kiosks at local outreach events, as well as one-on-one visits with growers and residents. Orchard growers and urban owners of host trees are responsible for keeping their property free of codling moth infestations. Legislation authorizes SIR staff to ensure compliance with these laws and, as necessary, allows for orders to remove infested materials or neglected host trees.